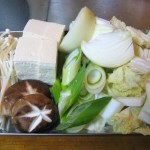 I titled this article as “Sukiyaki” because I thought English explanation might not be necessary. 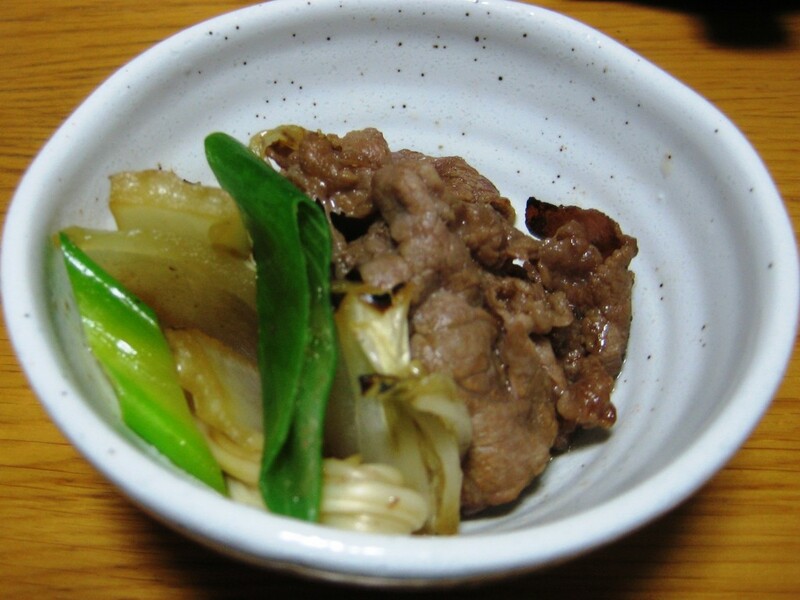 You may remember the song “Sukiyaki” by Kyu Sakamoto. It got #1 of Billborad weekly ranking in 1963. This song has been covered by many musicians like 4PM in 1995. I don’t know why this song titled as Sukiyaki in English. Original Japanese title is “Ueo wo muite aruko” that means “Let’s walk facing up.” Anyway, “Sukiyaki” may be the word which can imagine Japan. 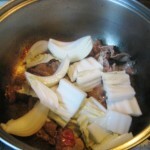 2) Pour cooking oil in a pan and bake 2 or 3 pieces of sliced beef. 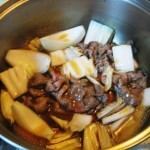 (Beef tallow is better than cooking oil) Once beef is baked, put some Chinese cabbages and onions in a pan and fry. 3) Some water comes from vegetables, put sauce in a pan and mix all stuff. 4) Then put tofu, enoki mushroom and shiitake mushroom in a pan and simmer all stuff together. I usually cook until 4) in the kitchen, then bring a pan to the table to eat and keep cooking on a small stove. If food stuff becomes less (had been eaten), add them in a pan. Also sauce will be added as you like. Eating with raw egg is also good. 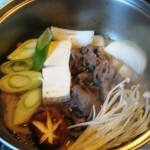 Sukiyaki is a kind of hot pot. Japanese hot pot is a food which people are eating while cooking. People are around the pot. It is like cheese fondu in Switzerland. However we can see some same style food in Asia, I am not sure there is same style in other region of the world. It may be difficult to buy thin sliced beef in countries like US. 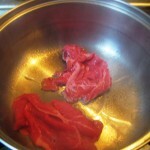 But I heard one of my Japanese friends who lived in US that he was asking to cut sliced beef at meat store. 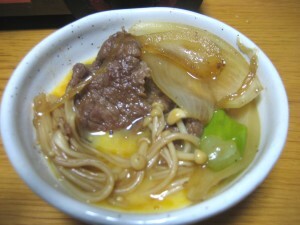 For sukiyaki, it is sliced as about 2mm. It is a little thicker than Shabu-shabu beef. These days, it is getting warm in Tokyo. Spring will come soon. It may be the end of season of hot pot….